one of his machines won the Gordon Bennett Gup in 191:5 for (lying at the record breaking speed of 124.8 miles per hour. The pilot and others of the racing team sent a sentimental telegram of congratulations to their "bon patron" behind the bars. Soon after the outbreak of the war M. Bleriot, another famous French pioneer of the air, took over the Deperdussin business to preserve the organization and staff of the firm. It then became known as the Société Pour les Appareils Deperdussin, from which the initials S. P. A. D. are derived. The plane was developed and perfected so that it became the one machine that assured the Allies air superiority in the war. It was fitted with an eight-cylinder Vee-type water-cooled Hispano-Suiza motor. This solid, fast and highly maneuverable plane carried twin synchronized machine guns and later was outfitted with one ii of the first air cannon. Ben6i-Mcrcie Machine Gun Firing Forward. The Propeller is Protected by a Deflection Plate Originated by R. Garros. portative," Ilotchkiss, better known in the United States as the Benct-Mercie. 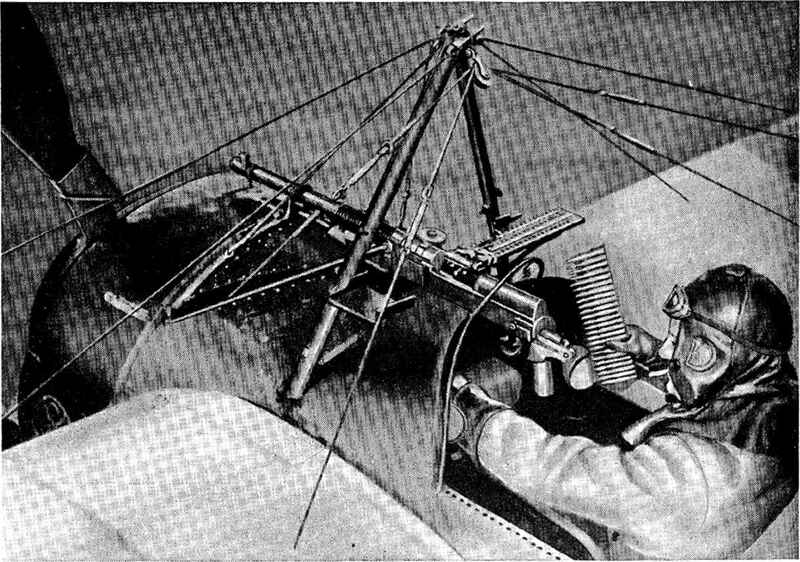 Nothing was done to the weapon itself to make it more adaptable for aircraft use, but in other instances it was modified to iced by a belt in lieu of the strip feed. The time-honored system of having the belt and cartridges rolled on a drum and all attached to the weapon's receiver was used so as not to interfere with its flexibility. Deperdussin was a French silk dealer who was reputedly very wealthy. Me took to making fast airplanes as a hobby in 1911 and spent so much money on them that he went bankrupt. When his affairs were investigated, he was sent to jail for fraudulent transactions in silk.